The First Round of the Tweedie Cup took place last Saturday with most of the results mainly as expected. Creetown secured a second round tie at the expense of Dumfries YMCA by virtue of a resounding 8-0 victory. Ross Landers went nap with five goals to his credit with Dean Fyfe, Micky Sutherland and Gavin Williamson chipping in with a goal each to complete the rout. In the Newton Stewart v Upper Annandale game Newton's No.8 Robert Hughan comes under pressure from No.7 Peter Pagan. The match at Blairmount between Newton Stewart and Upper Annandale brought six goals with the home side going through in a 4-2 victory. Johnny Fisher put the Creesiders ahead after 19 minutes and five minutes later striker Robert Middleton doubled the scoreline to give his side a comfortable lead to take into the second half. However the visitors brought themselves back into the match just after the restart but in the 54th minute Middleton restored Newton’s two goal lead. 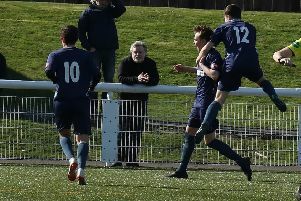 With ten minutes left to play on loan Craig Rudd playing his first game for the home side scored goal number four and although the visitors netted a second in time added on the final result was never in doubt and Newton Stewart booked their second round place. There was a high scoring match at Sanquhar where Nithsdale Wanderers beat Mid Annandale 8-6 after extra time. Lochmaben won 2-1 against Lochar Thistle and Threave Rovers v Abbey Vale and Wigtown and Bladnoch v St Cuthbert Wanderers were postponed.